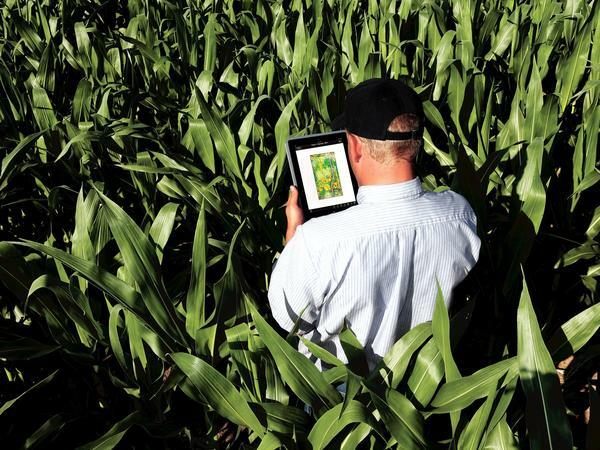 Should Farmers Give John Deere And Monsanto Their Data? Each box on this Monsanto FieldScripts map represents an 18-by-18-foot unit of field. The colors represent different planting rates. Companies, like John Deere, that are collecting farmers' data may be able to see how much grain is being harvested, minute by minute, from tens of thousands of fields. 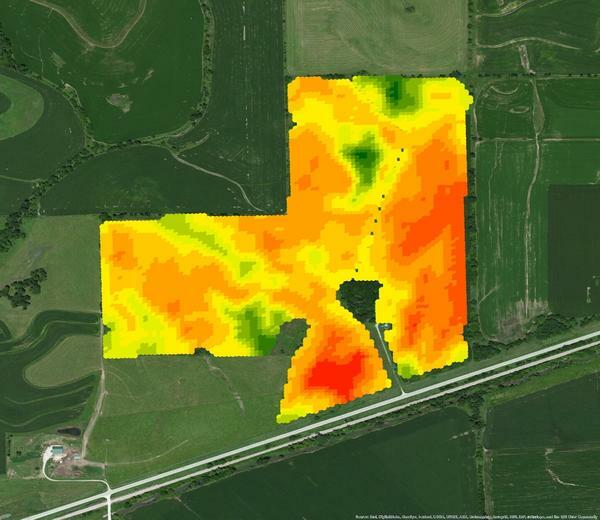 Starting this year, farmers across the Midwest can sign up for a service that lets big agribusiness collect data from their farms, minute by minute, as they plant and harvest their crops. Monsanto and John Deere are offering competing versions of this service. Both are promising to mine that data for tips that will put more money in farmers' pockets. But a leading farm organization, the American Farm Bureau Federation, is telling farmers to be cautious. These services, it says, could threaten farmers' privacy and give the big companies too much power. The data in question come from detailed maps of farmers' fields. Jonathan Quinn, who grows corn, soybeans and wheat on a large farm in northeast Maryland, pulls out a thick binder, opens it up on his kitchen table, and shows me an example. The rectangular outline of one field is covered with multicolored curved shapes, like a weather map showing areas of different temperatures. The dark green areas, Quinn explains, are areas that produced higher yields. Light green and red areas produced less. "And this gray area, that's just zero yield," he says. The amount of variation is astonishing. It happens because soil types vary, even within a single field. So does moisture. Quinn pulls out the machine that collects the data for this map. It's a superaccurate GPS receiver — an oversize version of the kind you'd have in your car. At harvest time, it goes along in the combine, recording how much grain comes from every spot. Later, at planting time, the receiver controls the planting machinery, placing seeds closer together where the soil is more fertile, or switching seed varieties to match conditions in different parts of the field. Essentially, the planter is following a pre-programmed "prescription" for each part of the field. "It's all done on software," Quinn explains. "It's loaded onto a thumb drive; you stick the thumb drive into this [GPS display], and when you drive across the field, it automatically knows where it is because of the GPS." Until now, all this information about his planting and harvest stayed in Quinn's hands. But this year, he's taking the next technological step, participating in an experimental version of the data-sharing system that Monsanto is rolling out commercially in the Midwest. Data will be transmitted directly from his tractor or combine into what computer people call "the cloud," where it will land on Monsanto's computer servers. "They're going to be able to see everything this [GPS] monitor does. So they're going to be able to look at my field all the time. They'll be able to look at my information, and they're going to just watch that field," Quinn says. Monsanto thinks it can help farmers come up with the perfect prescription of seeds for their soil and weather because the company will have more data than any one farmer can collect or analyze. It will have more detailed soil maps and information from many other fields with similar soil conditions. "I've had people ask me, 'Why should Monsanto have all your information?' " Quinn says. "My theory is, if they have my information, and they're out there working with me, I'm hoping that they're going to bring me a better product. And them having my information doesn't bother me." John Deere, the big farm machinery company, is offering something similar in collaboration with other big seed companies. Both companies are promoting this as a better version of what farmers do already. But the American Farm Bureau Federation is telling its members: Be careful. This is different. 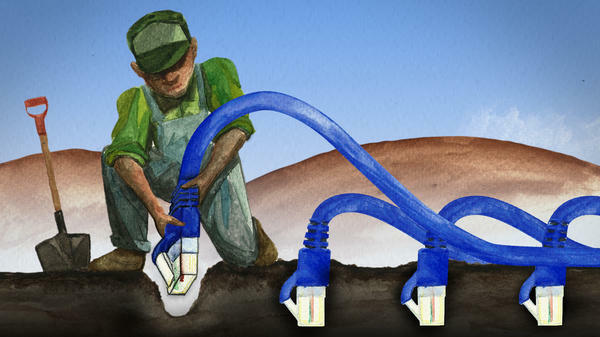 Mary Kay Thatcher, the farm bureau's senior director for congressional relations, says farmers should understand that when data move into the cloud, they can go anywhere. For instance: Your local seed salesman might get the data, and he may also be a farmer — and thus your competitor, bidding against you for land that you both want to rent. "All of a sudden he's got a whole lot of information about your capabilities," Thatcher says. Or consider this: Companies that are collecting these data may be able to see how much grain is being harvested, minute by minute, from tens of thousands of fields. That's valuable information, Thatcher says. "They could actually manipulate the market with it. They only have to know the information about what is actually happening with harvest minutes before somebody else knows it. I'm not saying they will," says Thatcher. "Just a concern." Both Monsanto and John Deere say that they'll share an individual farmer's data only with people whom that farmer wants to see the information. "In our mind, that data is just as important as a person's banking information," says Chris Batdorf, a manager with John Deere's Intelligent Solutions Group. Batdorf also says that his company won't use the overall, aggregated data — for instance, harvest totals from whole groups of farms — to play in commodity markets. "John Deere will not do that," he says. "We don't want to do anything with markets or forecasting with this data." A Monsanto spokesperson said the same. But many of the rules for how these data will be shared, and how they can be used, haven't been written yet. These data collection programs are just getting off the ground, and they're still evolving. It's not just our cars that are following us. Now, farm technology. And this year, Midwestern farmers can sign up to let big agricultural businesses look over their shoulder minute by minute as they plant and as they harvest their crops. In return, those companies promise to help farmers earn more money. But a leading farm organization says this can give too much power to big corporations, as NPR's Dan Charles reports. DAN CHARLES, BYLINE: Looking out across a field of corn, it may all look the same. But usually, it's not. The soil varies. So does moisture. Some sections of a field often produce twice as much as others. Jonathan Quinn, a big grower of corn, soybeans, and wheat in northeast Maryland pulls out a big binder, opens it up on his kitchen table and shows me a map of one field. It's covered with multicolored curved shapes like a weather map showing areas of different temperatures. JONATHAN QUINN: The dark green is a better yield, and this grey area, that's just zero yield. CHARLES: And Quinn shows me the machine that collected the data for this map. CHARLES: A super-accurate GPS receiver, a kind of oversized version of the kind you'd have in your car. At harvest time, it goes along in the combine, recording how much grain comes from every spot. Then at planting time it controls the planter, putting seeds closer together where the soil is more fertile, or switching from one seed variety to a different one to match the moisture conditions. Quinn calls it a prescription. It's all pre-programmed into that GPS device. QUINN: It's all done on software. It's loaded onto a thumb drive. You stick the thumb drive into this. And when you drive across the field, it automatically knows where you're at because of GPS. CHARLES: Until now, this data stayed right on Quinn's farm. But this year he's taking the next technological step. As part of a research project set up by the seed and chemical company Monsanto, it will go straight from his tractor or combine via wireless magic into what computer people call the cloud. It'll land on Monsanto's computer servers. QUINN: They're going to be able to see everything this monitor does. So, they're going to be able to look at my field all the time. They're going to look at my information, and they're going to just watch that field. CHARLES: Monsanto thinks it can help farmers come up with the perfect prescription, the perfect mix of seeds for their soil. It's betting that farmers will pay for this service because the company will have data than any one farmer, a more detailed soil map, information from other farmers dealing with similar soil conditions, eventually weather predictions from a high-tech venture called the Climate Corporation, which Monsanto bought last year for a billion dollars. QUINN: You know, I've had people ask me why should Monsanto have all your information? My theory on it is if they have my information and they're out there working with me, I'm hoping they're going to bring me a better product. And them having my information doesn't bother me. CHARLES: In the Midwest, Monsanto's been doing this already. It's launching a commercial version service this year across several states. John Deere, the big farm machinery company, is offering something similar in collaboration with other big seed companies. They're selling it as a better version of what farmers do already. But an association of farmers, the American Farm Bureau Federation, is telling its members be careful. Mary Kay Thatcher from the Farm Bureau says farmers should understand when data moves into the cloud, it can go anywhere. For instance: Your local seed salesman might get it; and maybe he's also a farmer, a competitor, bidding against you for land that you both want to rent. MARY KAY THATCHER: He's all of a sudden got a whole lot of information about your capabilities. CHARLES: Or consider this: up in that data cloud, you might be able to see how much grain farmers are harvesting minute by minute from tens of thousands of fields. That's valuable information. THATCHER: They could actually manipulate the market with it. You know, they only have to know the information about what's actually happening with harvest minutes before somebody else knows it. Not saying they will. Just a concern. CHARLES: Both Monsanto and John Deere say they'll share an individual farmer's data only with people whom that farmer wants to see it. Here's Chris Batdorf, a manager with John Deere's Intelligent Solutions Group. CHRIS BATDORF: In our mind, that data is just as important as a person's banking information. CHARLES: And he says his company will not use the big picture data, for instance, about the size of the harvest to play in commodity markets. BATDORF: We don't want to do anything with markets or forecasting with this data. CHARLES: A Monsanto spokesperson said the same. But many of the rules for who will get this data and how it can be used haven't been written yet. The data collection programs are just now getting off the ground, and they're still evolving. Dan Charles, NPR News. Transcript provided by NPR, Copyright NPR.